He’s Eggsy, he’s Robin Hood, and now he’s Sir Elton Friggin’ John. Taron Egerton steps into the shoes – winged shows, actually – of the legendary musician in the upcoming musical biopic, and we’ve got the first look at him. Dexter Fletcher’s Rocketman will hop through time to chart the life of the iconic pop star, from his origins at the Royal Academy of Music to superstardom. 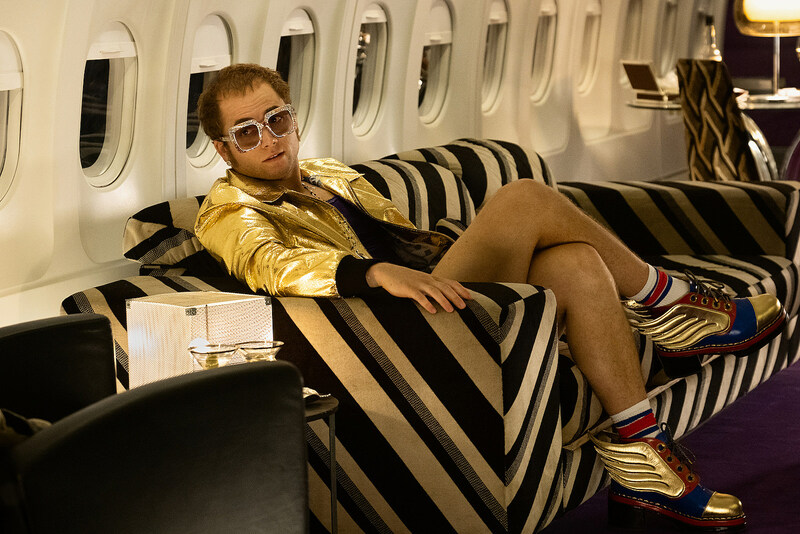 Paramount released the the first official photo of Egerton on a private jet donning a gold jacket, sparkly big sunglasses, and gold-winged boots – where can I cop a pair of these?! Everyone thinks it’s a biopic. It isn’t. It’s a fantasy musical so it’s actually his songs used to express important beats in his life at emotional moments. He’s not the only character that sings. It’s going to be fun. The Kingsman star also lends his own voice to the music of the film, and apparently he did such a good job it blew the real Elton John away. Rocketman also stars Jamie Bell, Game of Thrones‘ Richard Madden, Bryce Dallas Howard, and Gemma Jones. Stay tuned next week when the first trailer arrives. The film hits theaters May 31, 2019.